Do you offer split portions in your location? For instance, many pizzeria’s offer 1/2 & 1/2 pizza or allow customers to change something on a 1/4 or 1/3 of the pizza. All of that is easily handled through the Portion section of SP-1. SP-1 allows you to setup unique pricing for the different methods of split portioning as well. Do you offer delivery as an option? If so, you should know that SelbySoft has a number of driver reimbursement options for you to look at. Per Item: If you compensate based on the number of items delivered, this is the way to go. This will allow you to setup a price for compensation based on the menu group item that the employee delivers. For example: paid by the pizza. Per Ticket: The most common method of compensation for drivers. They are paid based on how many tickets they deliver (in the example it is $1.00 per ticket). Percentage: With this method, you are able to compensate by a percentage (it can differ per employee). This is a great way to reward an employee who works harder by giving them a higher percentage. Mileage: When this is selected, drivers can enter the starting and ending odometer mileage of their vehicles. Employees are then compensated by the mile. None: Pretty easy. . . There is no additional compensation! 1/2 & 1/2, 1/4’s and 1/3’s! Portion Setup for Pizza! Do you sell pizza? If so you have probably run into 1/2 & 1/2 pizza situations. SP-1 supports that and more. We support 1/2 & 1/2 as well as 1/4 and 1/3 pizzas (if you wish!). Below is a screen shot showing a large supreme pizza. This pizza has extra sauce on the whole pizza. We have taken salami OFF the first quarter and ADDED jalapeno to the first quarter. You can see the other three quarters as well. 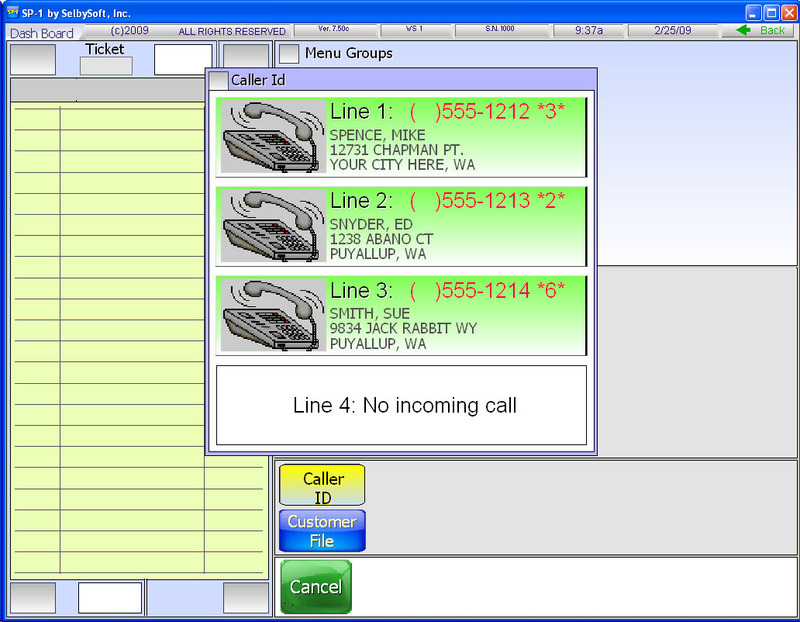 Caller Id for Deliveries and Pickup! Do you take phone orders? If so, you can save your staff time by implementing a Caller Id system. SelbySoft has a fully integrated Caller ID system that allows your employees to see who is calling in! 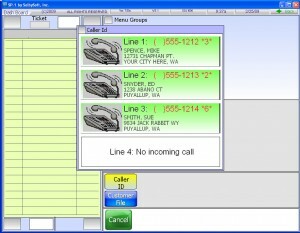 This caller id system will appear when the phone rings. SP-1 will show you the customer name and phone number. If that customer is already in your customer database, the address will be shown as well. 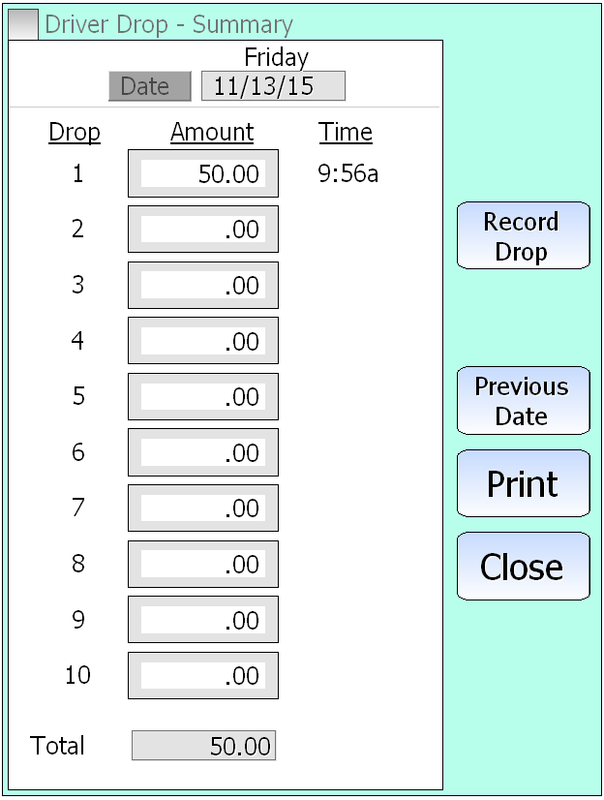 When you select the appropriate button, SP-1 automatically pulls up the customer and shows you their information and last order. That eliminates having to enter the entire phone number when you answer the phone. If the customer is not in the database then you have the option to add that customer. Once you add, the name and phone number information are automatically added to the customer file by the caller id system. That eliminates having to re-type that information in. Give us a call if you would like to explore this option more fully! There are some neat little factoids for you about Caller ID below! Theodore George “Ted” Paraskevakos from Greece, was the first person to patent caller id technology. This happened in 1968. From 1969 to 1975 he was granted 20 or so patents on that technology. Kazuo Hashimoto, a Japanese inventor with over a 1,000 patents built the first prototype caller id display. That is now on display in the Smithsonian!